Have you ever wanted to hear straight from another parent about what it’s like for your child to be hearing for the first time? Mothers know best, as they say! Meet Chelsea, whose one-year-old son Elijah is a bilateral cochlear implant recipient. Chelsea first wrote for the MED-EL Blog a few weeks ago about how it felt as a parent to find out Elijah had hearing loss. In this second post, Chelsea shares all the excitement and anticipation leading up to when her son would be hearing for the very first time—Elijah’s activation day. Since learning that our son, Elijah, was a cochlear implant candidate, his activation day was the most anticipated day of our lives as parents! This day was when our son—who was born profoundly deaf—would be hearing for the first time! In our anticipation, we spoke with a lot of parents who also went through this process. We learned that different children have different reactions when hearing for the first time. Some children have no reaction to hearing for the first time, they simply just try to figure it out. My husband, Michael, and I were so excited to see how Elijah would feel about hearing. Imagine not hearing since you were born and then—BAM! A whole new world! On Elijah’s big day, not only were his lovely cochlear implant audiologist, Laura, and his amazing surgeon, Dr. J, present, but he had a whole support team there including Michael and I, his grandparents, and his uncle. Elijah knew something big was going to happen because everyone was there. He loves being at the center of attention and immediately tried to make everyone laugh when they walked in. I’m telling you, he is his dad all over! We also asked our MED-EL audiologist, Nathalie, to be there for his initial activation when Elijah would be hearing for first time. Throughout this whole process, Nathalie has become such a trusted part of our family and we just wanted her assurance that everything with the programming was where it should be. She, of course, was excitedly there! 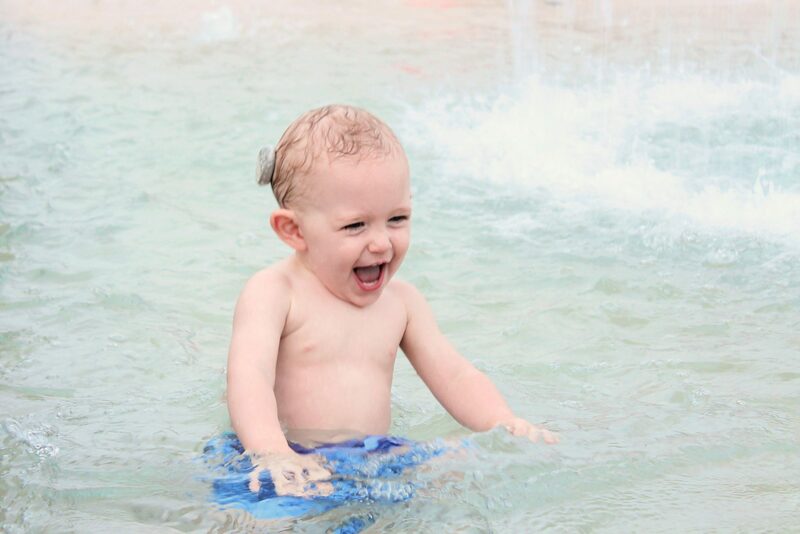 Elijah received hearing aids at two months to help stimulate the cochlea. Because of this and other cochlear implant preparation appointments, he was so used to people messing with his ears. So, it did not bother him when they put the cochlear implant audio processor on for the first time. Before Laura and Nathalie turned the implants on, Dr. J told us to speak softly and tell Elijah a bunch of reassuring things. While dad held him, Laura told us what she was doing as she turned them on. Excitedly, I said, “Elijah.” He whipped his head around and everyone in room couldn’t help express their amazement with a “whoa!” He was smiling! Elijah was smiling because he was hearing our voices! His smile was a bit of nervous smile at times as he was hearing for the first time. Dr. J said that he is simply trying to decide whether this was a good or bad thing because hearing sound was so new to him. Right after his activation, Elijah would not make a sound with his new ears on. I think being able to hear his own voice was shocking for him! Now, a little over two months after his activation, we cannot keep Elijah quiet! He loves making sounds and we, as parents, love hearing him! Something really cool is that he knows the sounds come from his new ears, and uses it to his advantage! Elijah takes the term “selective hearing” to another level! If we are around a noise that he does not like, such as a baby crying, Elijah will simply take off his “ears”—his audio processors. Ha! He also has speech and hearing therapy three times per week. My heart melts every time he copies a new sound! His favorite sounds to copy are “moo” for cows, and “ma” for mama! Elijah also knows his name and responds to it! My son that was born profoundly deaf, turns around when I call his name! We are so blessed to be on this auditory adventure and cannot wait to share with you all his future accomplishments! 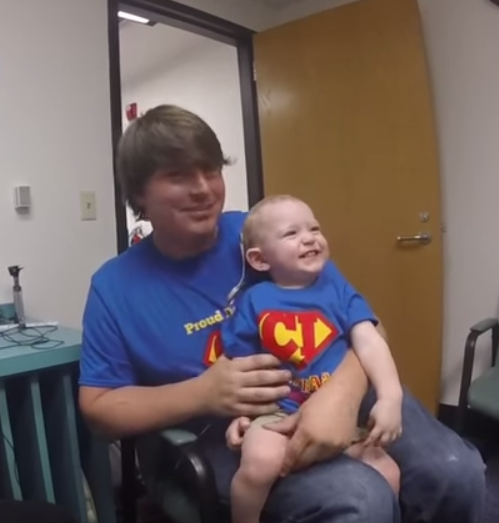 Click here to watch a video of Elijah hearing for the first time. Chelsea will be taking us on Elijah’s hearing journey through a series of upcoming posts on the MED-EL Blog. You’ll be able to get tips and tricks on bringing up your child with hearing loss—straight from a mom. Chelsea has been running her hellohearingblog since July 2016, sharing her family’s story. Her aim is to help other parents of a child with hearing loss beginning the journey with a cochlear implant. Go check it out! Liked this post on Elijah hearing for the first time? Subscribe to the MED-EL Blog by entering your email below to get tips and tricks, and guest stories sent straight to your inbox every week!